Getting ready for craft shows is like working on an assembly line. Need to have enough product made to sell and make money. I am just finishing up 96 Christmas potholder bowls. There are 72- 10 inch bowls and 24- 12 inch bowls. It takes 144 squares of both the fabric and the inner batting for just the 10 inch bowls, and then of course 48 squares of the same for the 12 inch bowls. I first start with a cutting day. I gather my cutting mat, wheel cutter and quilt ruler. Then grab all the fabric I plan to cut. I used 4 different patterns for the Christmas potholder bowls. I bought 4 yards of each pattern. Which made the 96 bowls. I actually buy a whole bolt of the batting at a time. It took one whole bolt plus 3 yards to make these bowls. After cutting everything, I match up the batting with the square and put them into a pile. There they will set until I have time to sew. I will set small goals of how many quantities I will sew when I have limited amount of sewing time. To sew one bowl it takes 2 squares with the batting sewn together. This is down crosswise, so it looks like a big X on it. Then darts have to be sewn on the sides, so it will make the "side" and be able to hold the bowl. the dart is cut off then, just leaving the sewn part. Put the 2 right sides together, pin and sew, leaving a gap in which to turn it right side out. When right side out, must sew the gap shut and go around the whole bowl at the top. When I am sewing a large quantity, I will put a laundry basket next to me, I throw the sewn part in there until I complete my sewing. This way they stay cleaner and are easier to move to do the next part. I love the sewing, and going to craft shows, meeting new people and of course making money by selling my creations. 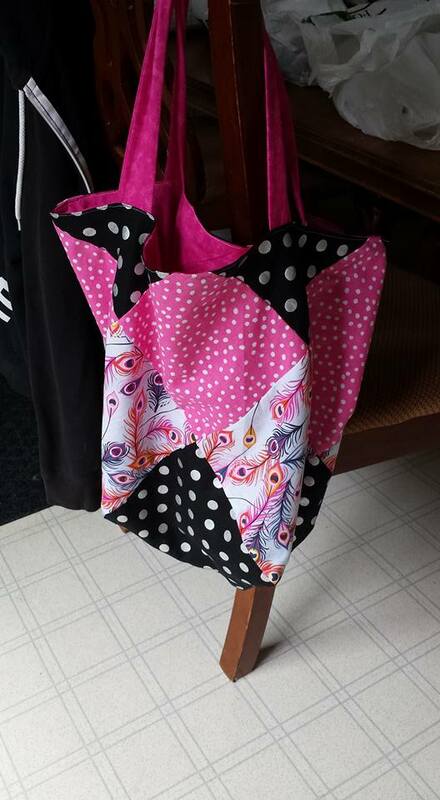 Fun favorites from Patti's sewing room! cuddly bear with matching sleeper for baby! three little bears with their matching quilts, just waiting for baby to arrive! sCHlep bags - big enough for a purse, a portfolio notebook and a bunch of other items.